Khao Soi, left, and mango lassi from Aladdin Noodle Shop in Fitchburg. 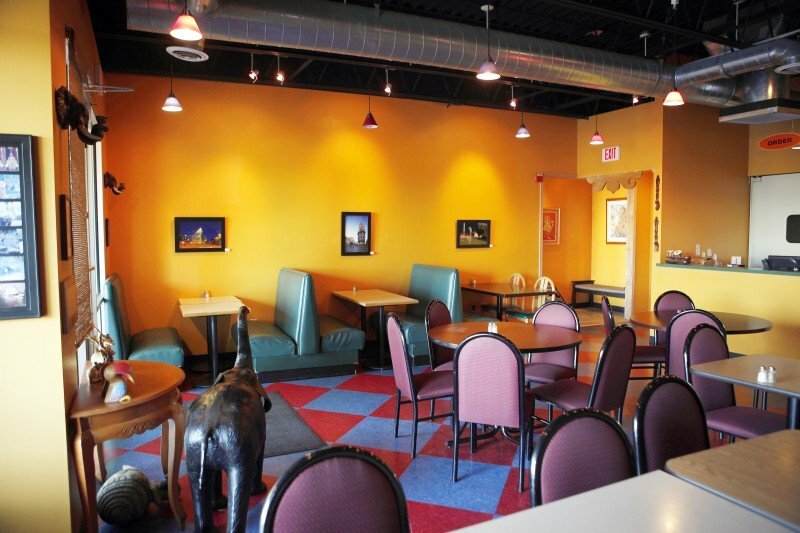 The interior of Aladdin Noodle Shop in Fitchburg. FITCHBURG — A genie’s lamp is just the right logo for Fitchburg’s newest dinner destination. 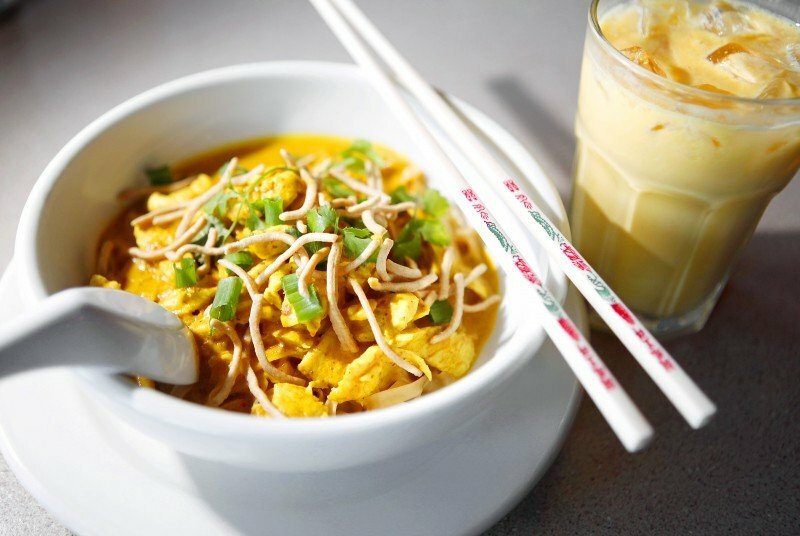 Aladdin Noodle Shop, opened in August by the folks behind Curry in the Box, is a hidden treasure trove of warm Thai curries tucked into a strip mall off of Fish Hatchery Road. The exterior is nondescript, the dining area similar to any other casual food joint. But on a hectic weeknight, you can’t beat these curries — red, yellow and green, familiar but exotic, simmered for hours and ready in minutes. Close your eyes, breathe in the turmeric, bay, coriander and cumin, and forget that it’s only Wednesday. Aladdin Noodle Shop can make one 30-minute dinner the best half hour of your week. Apichart and Anne Santipiromkul opened Aladdin Noodle Shop in early August, and the two restaurants are not yet separate entities. On two visits for dinner — the Aladdin menu is available between 5 and 9 p.m. most nights — we were seated on the Curry in the Box side of an adjoining wall. Lovers of the Santipiromkuls’ marvelously spiced lunchtime curries (soon to be all of Fitchburg, I predict) will be happy to see some of the same dishes on Aladdin’s dinner menu. With just one star for a “little spicy,” yellow curries were especially good, warm with Thai chili and full of tender vegetables — potatoes, peas, carrots, broccoli, zucchini and squash. Fat chunks of sweet potatoes were the most filling part of one yellow curry ($9.95). A simmered dish called khao soi ($8.95) with flat egg noodles and chicken breast came with crispy chow mein noodles, like a tiny nod to those La Choy dinners I loved as a kid. Long-simmered beef broth in a hearty bowl of Bangkok beef pho ($8.95) seemed to radiate good health, with crunchy mung bean sprouts and pungent cilantro scattered on top. A standard take on Pad Thai was simple and solid ($8.95). Pillowy pork and mushroom-filled bao, or steam buns, combined savory with a touch of sweet, seasoned with five spice powder ($2.25 per bun). Pot stickers ($4.95), an appetizer substitution from Curry in the Box when the bao weren’t available, offered a nice surprise — no browned crunch, just delicate little pouches of ground pork and green onion in a thin wrapper. Aladdin also does a slightly thick mango lassi ($2.95, sweet) and a decent Thai iced coffee ($2.25, even sweeter). But the real draw is the curries. Try the fantastic red curry with chewy tofu and tender winter squash ($8.95, “medium spicy” — and not messing around) or the milder Panang chicken curry in peanut sauce ($8.95), dotted with green peas, carrots and potatoes to soak up the sauce. Even the sauce-to-rice ratio was just right. Service at Aladdin/Curry in the Box could not be friendlier. Portions are well-sized; prices seem low for food this fine. Just like the genie’s lamp, with Aladdin Noodle Shop, look past the outside to find the good stuff within.